Be the first to share your favorite memory, photo or story of Edmon. This memorial page is dedicated for family, friends and future generations to celebrate the life of their loved one. Edmon E. Bolen, age 88, of Pine Top, KY, died Sunday, November 11, 2018, at Wells Hospice Center in Hazard, KY. He was born in Garrett, KY on March 31, 1930 to Bee Bolen and Dovie Hayes Bolen. Edmon has pastored many different churches for the past 60 Years. 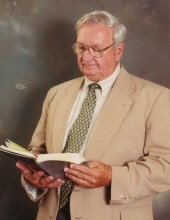 Funeral services for Edmon E. Bolen will be held at Hindman Funeral Services Chapel, Thursday, November 15, 2018 at 1:00PM with John Milam officiating. Burial will follow at Carr Fork Memorial Cemetery at Litt Carr, KY with military honors being conducted by Knott County DAV Chapter 171. Friends may call for visitation at the Chapel, Wednesday evening from 6PM to 9PM with a Celebration of Life Service at 7PM. "Email Address" would like to share the life celebration of Edmon E. Bolen. Click on the "link" to go to share a favorite memory or leave a condolence message for the family.